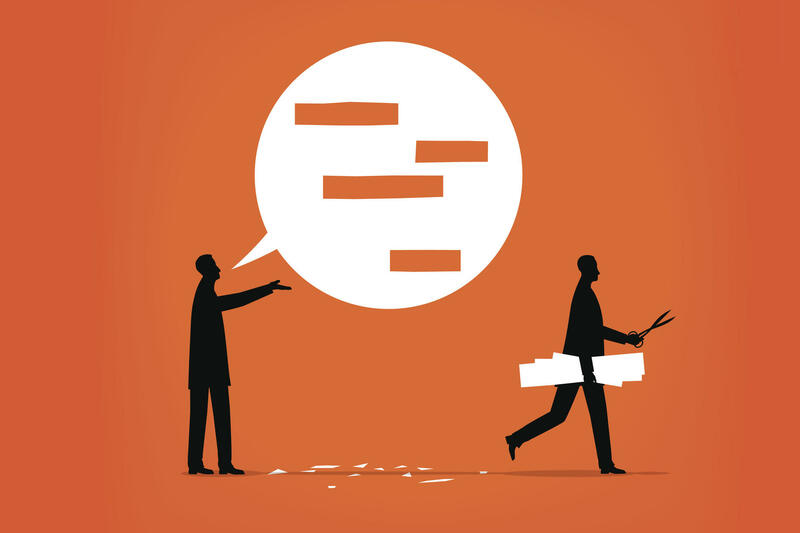 Linguist Geoff Nunberg argues that the media's decision to bleep or otherwise block out a particular word can result in concealing information the public needs to know. It has become a familiar story in a world bristling with live mics. A public figure is caught out using a vulgarity, and the media have to decide how to report the remark. Web media tend to be explicit, but the traditional media are more circumspect. Take the vulgar epithet that George W. Bush was overheard using to describe a New York Times reporter during the 2000 presidential campaign. Some newspapers printed it with dashes or asterisks. Others said it was a word that rhymed with "casserole" or "glass bowl." And The New York Times itself described the word as an obscenity, which made it sound worse than it was. It's easy to ridicule that coyness. Concealing the letters of a word with asterisks is the orthographic equivalent of covering them with pasties and a G-string --they manage to make it look both less shocking and more salacious. Anyway, whom exactly do editors imagine they're protecting? Some of them plead the familiar defense of "not in front of the children." The editors of The New York Times say that such words have no place in a "family newspaper." But if The Times really thought of their readership as including 10-year-olds, they'd add a comics page. The editors make a much better argument when they insist that the paper should stand for civility in public discourse. There's a lot to be said for honoring the collective sanctimony that forbids the use of these words in public life. It's in everybody's interest to be a little hypocritical about the words, if only to preserve their impact. Swear words couldn't convey strong emotion if we weren't flouting a taboo every time we say them. But you can carry the hypocrisy too far. At the signing of the health care bill in 2010, Joe Biden was caught on a live mic whispering to President Obama that the bill was a "big f***ing deal." Some people clucked their tongues or called the remark a gaffe, others applauded it as a sign of blue-collar authenticity. But come on. Biden was just using the F-word the same way most people do in private now and again, whatever their class — and whatever their gender. These words aren't the exclusive province of truck-drivers and sailors — in fact they never have been. When you swear, the words are bleached of their sexual or anatomical meanings, and swearing in private isn't considered a serious social transgression. If it were, we'd come up with a stronger condemnation for it than the infantile "potty mouth." So it doesn't really matter if the media bleeped Biden's word or simply described it as an expletive. Decorum was preserved, and it's not as if the media were concealing something the public needs to know. When that 2005 Access Hollywood videotape turned up, some of the media tried to treat it like other live-mic incidents. They danced around the language, particularly that one phrase that made it sound as if Trump was crowing about sexual assault. They paraphrased it as "grab women by the private parts" or "between the legs." Or they described the word he used as "a slang term for a woman's genitalia." But that left a lot of possibilities — in a brilliant segment on the Trump tape on her show Full Frontal, Samantha Bee reeled off about 30 slang words for a woman's genitalia in quick succession. Most of the media realized that it mattered which word Trump had used and tried to identify it, if not always explicitly. Some wrote it with asterisks, others got at it obliquely. NPR bleeped the word when they ran the tape and explained that it was "a very crude word that starts with P." That's how I'll refer to it here. But The New York Times broke with tradition when the editors decided to print the remarks uncensored. That was the first time any of these words had appeared in the paper with their literal sexual meanings. But then as best I can tell, it was the first time a public figure had been heard using the words that way, too. Trump wasn't swearing, and this wasn't just locker-room raunch. That's what made the remarks so unsettling — not so much the words as the attitudes they conveyed. The word Trump used may not be the most obscene term for a woman's genital area. But it's the one that focuses on it in a purely sexual way. That's why it can also be used as a collective term to reduce women in general to a purely sexual function. It's like referring to workers as hands or referring to children as mouths to feed. People keep describing Trump's remarks as lewd. But that word makes them sound merely leering and ribald; it brings to mind the red-nosed Dutch merrymakers in a painting by Franz Hals. At best "lewd" is just a genteel way of saying "dirty," which is a better description of the words themselves. But even that doesn't get at the predatory contempt they convey when the P-word is paired with that rapacious G-word, "grab." This is FRESH AIR. When the 2005 Access Hollywood videotape of the conversation between Donald Trump and Billy Bush surfaced, the media were faced with what's become a familiar problem. When a public figure is recorded using coarse language, how explicit should the media be in reporting the remarks? Our linguist Geoff Nunberg says this time was different. GEOFF NUNBERG, BYLINE: It's become a familiar story in a world bristling with live mics. A public figure is caught out using a vulgarity, and the media have to decide how to report the remark. The web media tend to be explicit, but the traditional media have been more circumspect. Take the vulgar epithet that George W. Bush was overheard using to describe a New York Times reporter during the 2000 presidential campaign. Some newspapers printed it with dashes or asterisks. Others said it was a word that rhymed with casserole or glass bowl, and The New York Times itself described the word as an obscenity, which made it sound worse than it was. It's easy to ridicule that coyness. Concealing the letters of a word with asterisks is the orthographic equivalent of covering them with pasties and a G-string. They managed to make it look both less shocking and more salacious. And, anyway, whom exactly do the editors imagine they're protecting? Some of them plead the familiar defense of not in front of the children. The editors of The New York Times say that such words have no place in a family newspaper, but if The Times really thought of their readership as including 10 year olds, they'd add a comics page. The editors make a much better argument when they insist that the papers should stand for civility in public discourse. There's a lot to be said for honoring the collective sanctimony that forbids the use of these words in public life. It's in everybody's interest to be a little hypocritical about the words if only to preserve their impact. Swear words couldn't convey strong emotion if we weren't flouting a taboo every time we say them. But you can carry the hypocrisy too far. At the signing of the health care bill in 2010, Joe Biden was caught on a live mic whispering to President Obama that the bill was a big F-ing deal. Some people clucked their tongues or called the remark a gaffe. Others applauded it as a sign of blue collar authenticity, but come on. Biden was just using the F-word the same way most people do in private now and again whatever their class and whatever their gender. These words aren't the exclusive province of truck drivers and sailors. And, in fact, they never have been. When you swear, the words are bleached of their sexual and anatomical meanings, and swearing in private isn't considered a serious social transgression. If it were, we'd come up with a stronger condemnation for it than the infantile potty mouth. So it doesn't really matter if the media bleeped Biden's word or simply described it as an expletive. Decorum was preserved. And it's not as if they were concealing something the public needs to know. When that 2005 Access Hollywood videotape turned up, some of the media tried to treat it like other live mic incidents. They danced around the language, particularly that one phrase that made it sound as if Trump was crowing about sexual assault. They paraphrased that as grab women by the private parts or between the legs or they described the word he used as a slang term for a woman's genitalia, but that left a lot of possibilities. In a brilliant segment on the Trump tape on her show "Full Frontal," Samantha Bee reeled off about 30 slang words for a woman's genitalia in quick succession. Most of the media realized that it mattered which term Trump had used, and they tried to identify it if not always explicitly. Some wrote it with asterisks. Others gutted it obliquely. NPR bleeped the word when they ran the tape and explained that it was a very crude word that starts with P. That's how I'll refer to it here, but The New York Times broke with tradition when the editors decided to print the remarks uncensored. That was the first time any of these words had appeared in the paper with their literal sexual meaning. But then as best I can tell, it was the first time a public figure had been heard using the words that way, too. Trump wasn't swearing and this wasn't just locker room raunch. That's what made the remark so unsettling, not so much the words as the attitudes they conveyed. The word Trump used may not be the most obscene term for a woman's genital area, but it's the one that focuses on it in a purely sexual way. That's why it can also be used as a collective term to reduce women in general to a purely sexual function. It's like referring to workers as hands or referring to children as mouths to feed. People keep describing Trump's remarks as lewd, but that word makes them sound merely leering and rebelled. It brings to mind the red-nosed Dutch merrymakers in a painting by Frans Hals. At best, lewd is just a genteel way of saying dirty which is a better description of the words themselves. But even that doesn't get at the predatory contempt they convey when the P word is paired with that rapacious G-word grab. GROSS: Geoff Nunberg is a linguist who teaches at the University of California, Berkeley School of Information. Tomorrow on FRESH AIR, the Twitter paradox, how a design that makes Twitter a great platform for free speech and interconnectivity has also made it a platform for bullying and harassment. We talk with Charlie Warzel who covers technology for BuzzFeed and has written a series of articles about what Twitter is and is not doing about trolling. I hope you'll join us. GROSS: FRESH AIR's executive producer is Danny Miller. Our senior producer is Roberta Shorrock. Our technical director and engineer is Audrey Bentham. Molly Seavy-Nesper is our associate producer for online media. John Sheehan directed today's show. I'm Terry Gross. Transcript provided by NPR, Copyright NPR.